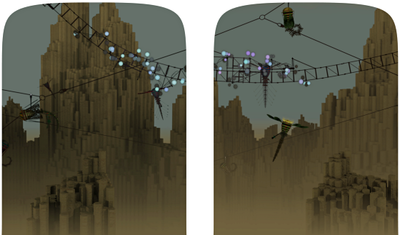 Lost Calls of Cloud Mountain Whirligigs (view 2, left & right). Smith, P. and Isley, V., 2010. 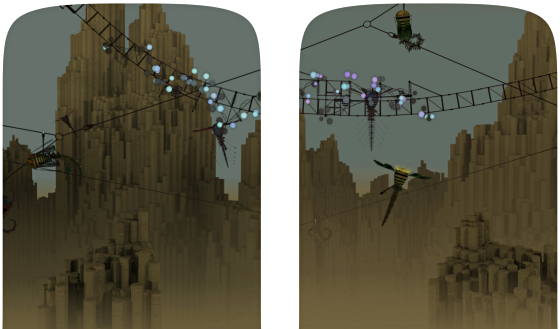 Lost Calls of Cloud Mountain Whirligigs (view 2, left & right). Computer generated.Istanbul, Turkey: UNSPECIFIED. Two computational systems created by V Isley & P Smith (aka boredomresearch) in 2010 as part of their new series. They consist of an environment that runs in real-time, shifting slowly from periods of brightness to darkness. Continuing to explore extended time frames but also pursue stillness and a gradual shifting state. The different groups of flying machines called Whirligigs have a biological and mechanical appearance. Occasionally, they call out their unique song, seeming restless in their abandoned world. When darkness falls the Whirligigs pulsing lights and glowing smoke calls are electrified. Each Whirligig group has a certain lifespan and when this ends a new generation is created, with unique calls, propellers and nose cones patterns. They all have an energy level and when this drops they try and perch on a wire to rest and recharge, slipping gradually into hibernation. This artwork uses a new compositing tool developed by boredomresearch to allow for the live compositing of animations. The animations rely on artificial intelligence to move the characters they include and do not require interaction. boredomresearch often think of themselves as employing computer gaming technology to create landscape paintings and life studies that move. Many of their works have been created using modelling techniques similar to those used by scientists to study naturally occurring phenomena. However their aim is to create something new of intrigue and beauty. This artwork was produced using Processing and Blender 3D. Lost Calls of Cloud Mountain Whirligigs, view 2 right and left was exhibited in the Expanded Box section at ARCO,Madrid (February 2010) and in 'E-volve' group exhibition at [DAM]Cologne (April-June 2010).